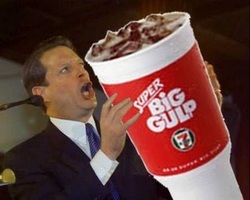 "The piece below was written in response to the many pundits who thought New York Mayor Michael Bloomberg’s proposal to ban “Big Gulps" was a good idea. The logic seemed to be that if people were too stupid to decide for themselves what to eat and drink, politicians should just do it for them. Almost all of it centered on the cost shouldered by the rest of us in the form of increased taxes as the result of rapidly growing medical expenditures. There was also a hint of disgust at how aesthetically unpleasing it was to see all those obese people freely walking around and thinking they had rights like everyone else. Who’d imagine such a thing, certainly not those youngish, hipster reporters who were headed off to the gym, looking all buff and stylish; they have priorities, not like those porkers who are probably Republicans. So, if you aren't going to make the right choice, someone better, smarter, and no doubt thinner, will make them for you....God help us all"! Americans seem to really like war! There’s the wars in Iraq and Afghanistan, we might even be fighting a war in Iran soon. You can never have too much war. There’s the war on drugs, and the war on poverty, although, nowadays, not many people seem to care much about that war. And then there is the war to end all wars, the one that will safeguard America’s future for generations to come—a blitzkrieg on all the porkers who lack the self-control to push away from the table long enough to catch a breath—the war on Big Gulps. Yes, those are the two choices that we’re faced with. Guerilla armies in Idaho or a shambling herd of the ponderous proletariat devouring a 48 oz. Big Gulp and a pack of Little Debbie Snack Cakes, huffing their way to the emergency room, draining off our hard-earned dollars like bloated leeches. This is politics in America. Subtlety of thought is not our strength. Unless it can be argued in a five-minute segment in what passes for a news show, it doesn’t exist. Most of the articles written in favor of Mayor Bloomberg’s proposal are really about President Obama. Progressives may not think much of the president, but at least he’s not a Republican, and that's reason enough to support him. His health care plan, which is really the underlying issue, will live or die based on cost projections. And if you have a nation of obese people who suffer from a broad range of self-induced health problems, well, the price tag will go up, and up, and then there will be no universal healthcare. That’s why bovine Americans everywhere need to be corralled like children and told what to do. You don’t want to stand in the way of progress. Especially when you’ve invested so much of your own political identity in the one person who stands for everything that you really believe in, namely yourself and the righteousness of your own beliefs. That big container of soda is a powerful symbol of so much more than just soda; it's really about the struggle for parity between the races, the rich and poor, the few versus the many. Now you know exactly how Jesus felt when he gave the Sermon on the Mount. It’s good to feel righteous! How does one get that righteous? It takes a lot of self-reflection for a start. Maybe you've read a book or watched a movie. And maybe that movie made you think, “Hey, it’s not good to dislike others just because they're different”. Unless they're fat and Republican of course. If you’d been around when Martin Luther King nailed those ninety-five suggestions about racism to the Wittenberg Door you would’ve been right there with him. And when you watched “Mississippi Burning” with Gene Hackman and Willem Dafoe, you remember the movie that was really just a remake of the “Untouchables," I mean the one with Kevin Costner and Sean Connery; not the TV show—you would’ve been there too. It doesn’t matter that it made all those poor, Southern blacks out to be a bunch of good negroes just sitting around, waiting for a couple of white guys to come along, toss everybody’s Miranda rights out the window and bust some heads. Because all that legal stuff doesn’t really work anyway, but it does make for a pretty entertaining movie—and you don’t have to think too much about who the bad guys are. It's good to not think too much. But now that you've thought about it, you realize that you're an awful lot like Tom Joad from John Steinbeck's novel “The Grapes of Wrath,” you know, the one where he says, “I’ll be all around in the dark - I'll be everywhere. Wherever you can look - wherever there's a fight, so hungry people can eat, I'll be there. Wherever there's a cop beatin' up a guy, I'll be there. I'll be in the way guys yell when they're mad. I'll be in the way kids laugh when they're hungry and they know supper's ready, and when the people are eatin' the stuff they raise and livin' in the houses they build - I'll be there, too,” and so will you. You and Tom Joad, Martin Luther King, Michael Bloomberg and all of the other people you admire. It’s good to know who to admire. That way it’s easier to know who to hate. Whether it’s the bank trying to take away the family farm, or slapping the sh*t out of a corpulent conservative with a beer hat filled with some kind of poisonous cola, it’s all the same. That’s why we need more people telling us what to do! We have way too much freedom! And when we behave badly (badly as defined by our leaders) we should not only be told what to do, but new laws should be put in place to punish us. You can’t have a nation of fatties draining off the public's limited bucks because they want to drink a vat of Mountain Dew! And while we’re at it, we’ll need to hire some food police to enforce this new law. Sure, it’ll cost us, and we’ll need to raise taxes to pay for it—and maybe we’ll lose the jobs and the tax revenue that are produced by the soda industry. And yes, the size of government will grow, which will require even more taxes at a time when we’re flat broke, suffering high unemployment and have a staggering national debt. Throw the war in there and you have the perfect moment in which to syphon off a bunch of cash from the businesses that are trying to create jobs and funnel it into the government’s coffers. It’s good to want to help people. You’ve got to have priorities you know, big government is good, even if it’s not all that efficient. Why is it inefficient? Because it’s the government, and it can do whatever the hell it wants! There’s one solution however, “VOTE THEM OUT OF OFFICE”! On the other hand, I shouldn’t have to worry about having my freedom taken away because some people think that what others do in private is somehow "Their" business. For my progressive friends; how do you not see the parallel between wanting to keep the government out of your bedroom, and my right to drink a Big Gulp? Isn't it clear, both parties love big government, just different kinds of big government. And that's the real problem! That and all the folks who believe that good intentions are the same thing as good ideas!